Krabi is a Thai province known for being more laid back than its neighbouring Phuket and Pattaya. Krabi is the place to visit if you are looking for a break from the hustle and bustle of the rest of Thailand. There are a range of beaches along the Andaman Sea, well known for its crystal clear waters and white sands. Relaxation is the name of the game in Krabi, in fact the only part of the place that isn’t relaxing, is working out which of the innumerable ways to relax to partake in that day. Krabi is not your usual beach holiday to a seaside town. The area is also well known for its collection of national parks and features much more natural beauty than just the beaches. These natural wonders include coral reefs, caves, waterfalls and smaller islands that fall within the Krabi province. The natural wonders are also a lot more than just pretty to look at, they have been put to good use making Krabi one of the world’s premier destinations for adventure sports, such as rock climbing and diving. As a part of Thailand, you know that you are getting great value when you take a trip to Krabi. 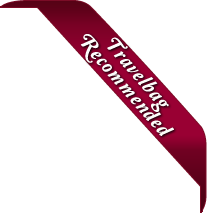 We at Travelbag.co.uk are able to provide you a great deal on your Krabi hotels and flights, from cheap hotels to beach hotels, we won’t be beaten on price. 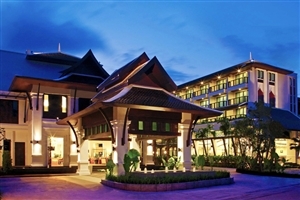 The range of hotels available in Krabi is a true draw to the place. 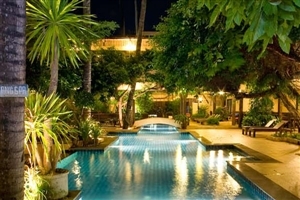 Even the cheap Krabi hotels offer a level of luxury that would be counted as top of the range in many other countries. Those looking for the best of the best hotels in Krabi will enjoy Centara Grand Beach Resort & Villas, a five star resort set within its own private bay that is ideal for those looking for a tranquil getaway. If this seems to be a bit too extravagant for your tastes, maybe you’d prefer to stay in the Krabi La Playa Resort, considered by many to be the best cheap hotel in Krabi, this resort is still not lacking in luxuries and is situated in a central location that makes it easy to explore the island. 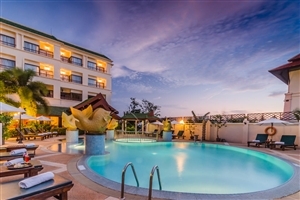 If you are looking for something between the two then we recommend looking at the Holiday Inn Resort Krabi, a hotel complete with tropical gardens to match the Centara’s beauty but still located close enough to the main parts of the island to allow easy travel. Enjoy a locally caught, freshly prepared seafood meal. Take a ride in a traditional long tail boat to see Khao Kanab Nam, the symbol of Krabi. Visit the Emerald Pool or 'Sramorakod' in Thai, a serene natural pool that has an unusual green colour due to the natural minerals in the water. Whatever you choose to do with your time in Krabi, book your 2019 or 2020 hotel stay with us today and make sure your accommodation is as memorable as the activities you enjoy while you’re there. Here is just a selection of our favourite and cheapest hotels in Krabi. Please use our search panel above to find your perfect choice. Located close to the sumptuous sands of Nopparat Thara Beach in Ao Nang, the Centara Anda Dhevi Resort & Spa is an excellent family-friendly Krabi holiday destination. Relax in comfortable and stylish accommodation, and take advantage of the excellent amenities, which include a fabulous 43m swimming pool, the award-winning SPA ... Cenvaree and a superb selection of dining choices to satisfy every discerning taste. 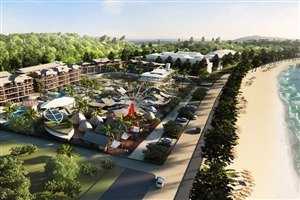 The Centara Anda Dhevi Resort & Spa is positioned close to Ao Nang’s popular shopping and entertainment districts. Located on beautiful Klong Muang Beach, Sofitel Krabi Phokeethra Golf & Spa Resort is a magnificent five-star resort just a short distance from the charming town of Ao Nang. 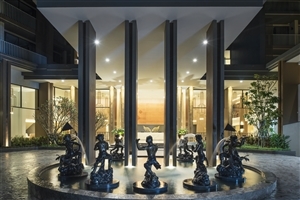 With its 276 lavishly-appointed guestrooms and suites, Sofitel Krabi Phokeethra Golf & Spa Resort is ideally positioned for guests to savour ... picturesque vistas across the shimmering Andaman Sea and the unspoiled, golden sands. 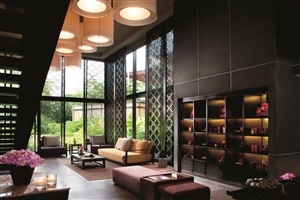 Sofitel Krabi Phokeethra Golf & Spa Resort is nestled into a tropical rainforest and boasts exceptional facilities, including a spa and a large swimming pool. An intimate Krabi holiday resort set on the pristine shores of Ao Nang Beach, Phra Nang Inn is an excellent value three-star property in a stunning location. Comprising of 69 smartly decorated and comfortable guestrooms and suites, Phra Nang Inn is mere steps from Ao Nang Beach and is perfectly ... positioned for guests to take advantage of the excellent shopping and entertainment areas of Krabi. Facilities at Phra Nang Inn include a pampering spa and relaxing swimming pools. Krabi La Playa is an intimate and beautifully-appointed resort located just 150 metres from the pristine sands of Ao Nang and Nopparat Thara beaches. Soak up the peaceful atmosphere when you stay at Krabi La Playa, where many of the 79 guestrooms look out over the calming blue waters of ... the Andaman Sea. Take advantage of fine facilities and ample amenities available at Krabi La Playa, where lush tropical gardens, two fine restaurants and a swimming pool will delight. The stylishly designed Tubkaak Krabi embraces the serenity of its surroundings by offering a relaxing and idyllic setting for an unforgettable Krabi holiday. A sanctuary for intimacy with its 42 guestrooms, the boutique style Tubkaak Krabi resort will delight with its welcoming ambience and quality touches, including Thai architecture and ... decoration. Looking out over the Hong Islands and the stunning landscape, Tubkaak Krabi is enhanced by its impressive facilities, including an indulgent spa, beachfront hammocks and a tropical swimming pool. Set at the foothills of Ao-Nang, Krabi Cha-Da offers comfortable and excellent value accommodation in a beautiful tropical setting. 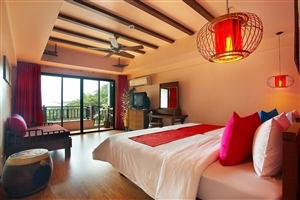 Ideal for those seeking a cheap Thailand holiday, Krabi Cha-Da offers spacious guestrooms overlooking the surrounding hillsides, while many rooms also feature panoramas across the Andaman Sea. 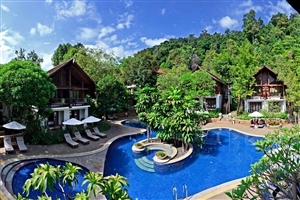 Generous facilities at Krabi ... Cha-Da include a restaurant and two bars, a large swimming pool and a fitness centre. Krabi Cha-Da is located close to many of Ao-Nang’s premier shops, restaurants and bars. Combining modern comfort and convenience with traditional Thai heritage and a soothing atmosphere, the Centra by Centara Phu Pano Resort provides travellers the opportunity to indulge in the sights and sounds of Krabi in style. Situated only a short distance from the idyllic resort town of Ao Nang, the resort ... enjoys a tropical setting surrounded by gorgeous vistas and exotic vantage points while the in-house wonders range from the welcoming signature restaurant, a variety of recreational facilities and a total of 158 plush-filled accommodations that balance the beauty of the surrounding area perfectly with their modern amenities. Secluded amidst its own tropical gardens and overlooking a stunning private beach, Dusit Thani Krabi Beach Resort is a magnificent venue for a dream Krabi holiday. Feel privileged when you stay in one of the 246 lavish guestrooms and suites at Dusit Thani Krabi Beach Resort and sample the delights ... of the Mandara Spa that comes as part of the excellent facilities package. With its friendly staff and attentive customer service, Dusit Thani Krabi Beach Resort offers effortless style and substance befitting of its five-star status. The Amari Vogue Resort is a beautiful oasis on the Krabi coastline offering exceptional five-star perfection. Amari Vogue Resort boasts magnificent views out over the Andaman Sea from its location on the golden sands of Tub Kaek beach, where guests can be assured of an intimate and idyllic Thailand holiday. 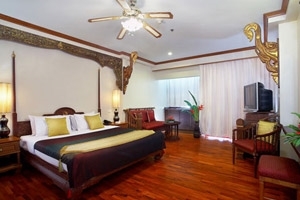 ... Feel exclusive in one of the 57 guestrooms, each luxuriously appointed and featuring an excellent array of amenities, while you can enjoy the authenticity of Thai hospitality in the pampering Sivara Spa and at the four restaurants and bars. Indulge in elegance and grandeur with a stay at the exceptional Rayavadee, a superb five-star resort that will tantalise all the senses. Surround yourself with stunning natural beauty at Rayavadee, located within the grounds of the Krabi Marine National Park, a position that enables guests to enjoy all manner of ... unique activities including rock climbing, diving and elephant trekking. Fringed by the pristine white sands and overlooking the Andaman Sea, Rayavadee invites guests to bask in the majesty of your settings as our friendly staff caters to your every need. The stunning Centara Grand Beach Resort & Villas is an exceptional five-star resort that reflects the epic natural beauty of Krabi in its authentic architecture and excellent hospitality. Looking out over Pai Plong Bay, resplendent in its soft, powdery sands and lapped by the gentle waves of the Andaman Sea, ... the setting for Centara Grand Beach Resort & Villas is truly extraordinary. Comprising 192 well-designed guestrooms and villas, Centara Grand Beach Resort & Villas delights with its effortless style and luxurious amenities that will ensure every stay here is refined and memorable. Tucked into a peaceful corner of Ao Nang Beach, the Krabi Heritage resort offers a high standard of Thai hospitality at excellent value. 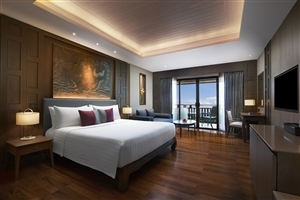 Located a short stroll from the shimmering sands of Ao Nang’s famous stretch of beach, the Krabi Heritage resort appeals with its spacious and airy guestrooms, including ... a selection that enjoy views out towards the sea. Facilities at Krabi Heritage include an all-day dining venue serving delicious Thai delicacies, a refreshing swimming pool and a state-of-the-art fitness centre. Nestled amidst the enchanting landscape of Krabi, Deevana Plaza Krabi embraces its tropical surroundings, only a short distance from Ao Nang Beach. The resort puts emphasis on providing guests with all the luxury commodities expected of a holiday resort and more, with particular focus on personalised experiences for a memorable ... stay in paradise. The fresh, pristine whites and warm wooden hues lend the resort an immaculate, luxurious feel as seen throughout the low-rise accommodations, which when accompanied by the beauty of the natural surroundings creates the sense of an oasis encircled by wilderness. Settled amongst seaside tropics and designed with Thai elements throughout, Chada Thai Village Resort serves as a comfortable getaway near Phra Nang Bay bordering the town of Ao Nang. 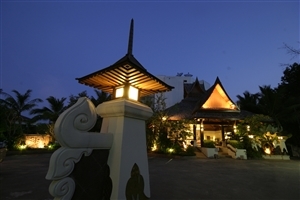 The resort consists of two to three story buildings, all adorned in Thai designs and colours, creating a synergy of modern ... comfort with traditional style. The rooms are set along landscaped gardens to further emphasise the surrounding environment, and with its restaurant and spa, this is a good choice when considering Thailand. Shadowed by the imposing cliffs of Krabi, Ao Nang Cliff Beach Resort is an intimate and personal retreat for a dream Krabi holiday. Ao Nang Cliff Beach Resort is located on the stunning Ao Nang Beach, a setting of epic natural beauty on the beautiful south Thai coastline. 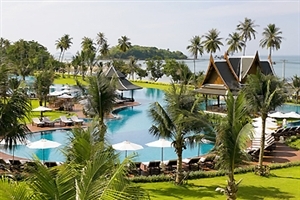 Ao Nang ... Cliff Beach Resort boasts a superb range of facilities, with a swimming pool, a wonderful restaurant and a fitness centre all available for you to enjoy. 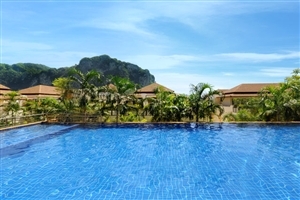 Ao Nang Cliff Beach Resort is 30 minutes from Krabi International Airport and is closely located to the tourist attractions and entertainment areas. With a privileged location on the unspoiled sands of Ao Nang Beach, Holiday Inn Resort Krabi Ao Nang Beach brings its renowned brand to a stunning Thai location. Just 30mins away from Krabi International Airport, Holiday Inn Resort Krabi Ao Nang Beach offers 55 elegantly-appointed guestrooms and suites, generous amenities ... and an international reputation for quality of service. Book a stay at Holiday Inn Resort Krabi Ao Nang Beach and prepare for the Krabi holiday you’ve always dreamed of. Situated along the soft sands of Krabi's northeast Fossil Shell Beach, The ShellSea Krabi serves as a tropical paradise that invites travellers to kick back, relax and indulge in the soothing ambiance of Thailand. Boasting a range of plush-filled accommodations, a number of elegant eateries and all the recreational facilities ... a traveller may need, this incredible sun-kissed resort is sure to impress. Nestled into its own stunningly beautiful Krabi cove, Phulay Bay & A Ritz-Carlton Reserve offers lavish five-star luxury in a setting of pure bliss. Admire the stunning scenery across the crystalline Andaman Sea from your villa’s infinity-edge swimming pool, dine in luxury at one of the many tempting restaurants and ... sink into a state of relaxation at the sumptuous The Spa, a stay at Phulay Bay & A Ritz-Carlton Reserve in Krabi is an opportunity to have your senses stimulated from the moment you arrive to the moment you reluctantly depart.